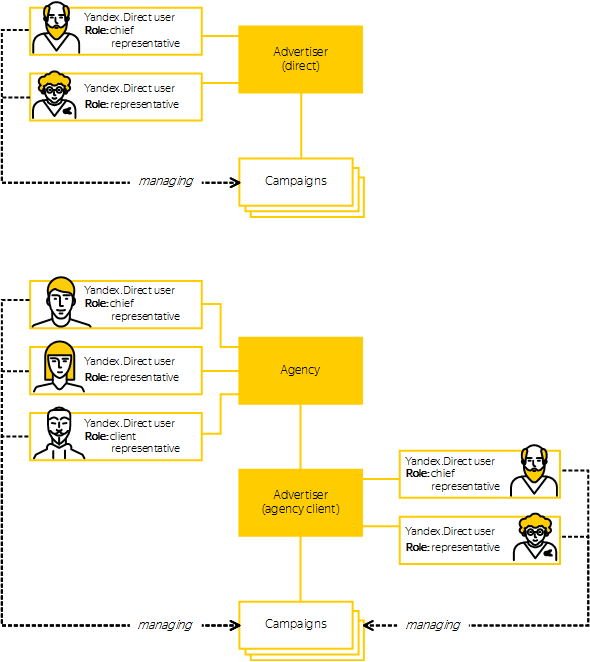 An advertiser's campaigns are managed by Yandex.Direct users. The actions available to a user depend on the user's role. The table below shows the user roles and access for each type of client. Chief representative Full access to manage the advertiser's campaigns. Full access to manage the advertiser's representatives: add, delete, restore, edit settings, and change the chief representative. Managing representatives is only available in the web interface (see Registering representatives in the Help for Yandex.Direct). Representative Full access to manage the advertiser's campaigns, just like the chief representative. Access to edit own settings. Chief representative Full access to manage all the agency's clients and their campaigns. Full access to manage the agency's representatives: add, delete, restore, edit settings, assign representatives to work with clients, and change the chief representative. Managing representatives is only available in the web interface (see Registering agency representatives in the Help for Yandex.Direct). Representative Full access to manage all the agency's clients and their campaigns, just like the chief representative. Access to edit settings for all the agency's representatives (except the chief representative). Manage clients that were registered personally or that were assigned by the chief representative. Access to edit own settings. An agency can only work with the data of a single client in each request. Each request must pass the client username (preferably the chief representative) in the HTTP Client-Login header. If the agency granted the advertiser read-only access to the web interface, the advertiser's representatives can only receive data via the API, as well. If the agency granted the advertiser permission to edit campaigns, the advertiser's representatives can use either the web interface or the API for managing their campaigns. Chief representative Access to manage the advertiser's campaigns, within the permissions granted to the advertiser by the agency. Full access to manage the advertiser's representatives: add, delete, restore, edit settings, and change the chief representative (only if the agency gave the advertiser access to the web interface). Representative Access to manage the advertiser's campaigns, within the permissions granted to the advertiser by the agency (just like the chief representative). Access to edit own settings (only if the agency gave the advertiser access to the web interface). Thus, an agency client's campaigns can be managed either by agency representatives, or by representatives of the advertiser itself, if the agency provided appropriate access.